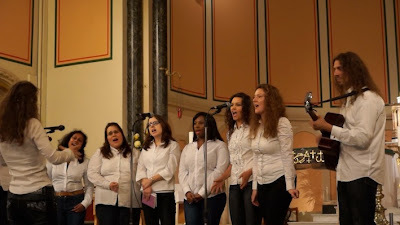 Happy Day Gospel Choir at St John the Evangelist is an enthusiastic young adults choir directed by Beatrice. We sing on the first two Sundays of each month at the 6pm Mass. We are a group of young people who come together to praise God through music. What we do is challenging, but brings a lot of fun. Through the joy and beauty of music and its Christian message, we want to create a happy, prayerful, and welcoming atmosphere for all. With uplifting words, moving tunes, and joyful hearts, we sound one loud spiritual trumpet call, proclaiming to all people the message of faith, hope, and love in our Lord Jesus Christ! The choir was formed in February 2009 by sisters Beatrice and Eva—both trained pianists and choral singers with a couple of decades of music experience. Since our first Mass on 8 March 2009, more people joined us from within and outside of the parish. In 2011, Matthew joined the choir as a guitarist. Matt is an extremely talented musician. He arranges our choral parts and composes Mass settings and songs. Matt is a professional opera singer, currently in his final year at Royal College of Music. Our music is rooted in contemporary gospel, with a blend of pop, folk, Latin and ‘modern classical’. We always tailor the songs to the current Gospel readings. It was St Augustine who said: ‘He who sings prays twice.’ Therefore, we praise God with song, and at the same time, we try to help people experience the Eucharist on a deeper level. Apart from active participation in Sunday Masses, we have sung at other events, such as Brightlights Catholic festival in Aylesford, Good Friday procession at the N1 Shopping Centre, Marie Curie charity concert; and at the special Mass dedicated to John Paul II and his relics at Corpus Christi Church in London. We also regularly sing in rest homes, and at festivals, charity concerts, and weddings. If you would like us to sing at your event or celebration, or if would like to join our choir, please, get in touch with Beatrice on beatrice-t@hotmail.com. See also our Facebook page with over 600 fans: www.facebook.com/HappyDayGospelChoir.